His Excellency Mahinda Rajapksa, President of Sri Lanka and the Commander in Chief of the Armed Forces today handed over Ranajayapura mega housing scheme to the war heroes. At a ceremony held at Ipalogma, the President handed over keys of 100 houses to their owners. Ranajayapura is a concept made reality under the Mahinda Chinthana program, the President's vision for the country's future. The housing scheme at Ipalogama marks the completion of the first phase of total project aimed at building 50,000 houses for the war heroes. Ranajayapura is the largest ever housing project built for the war heroes consisting 1509 completed houses with all modern amenities. The project was planned and implemented by the Ministry of Defence under the leadership of Defence Secretary Gotabaya Rajapaksa. With his great interest in ' looking after the men behind the weapon" , the Defence Secretary gave the top priority to housing project over many other Ranaviru welfare projects carried out under his guidance. Additional Secretary of Defence, and the project coordinator Mr. Willy Gmamage speaking to defence.lk said that the cost of each three roomed house with bathroom, pantry and a ten perch land was Rs. 1.4 million. The government has borne Rs. 600,000 of the total cost and the remaining Rs. 800,000 was given as interest free loans to the recipients which are expected to be recovered within ten to fifteen years. Also, the housing scheme is provided with a Super Market, a Bank of Ceylon branch, a primary school a daycare unit and a well equipped hospital . The Foundation stone was laid for the project on the 14th December 2006. The construction was initially undertaken by NACL but later taken over by the Sri Lanka Navy engineers. With an untiring effort and commitment, navy engineers accomplished the task of completing 1509 houses within 15 months. Former Commander of the Navy Admiral Wasantha Karannagoda made tremendous efforts even during the humanitarian operations to accelerate the project. After him, Vice Admiral Thisara Samarasinghe, Commander of the Navy taken over the uphill task and accomplished it. The following graph shows the speedy progress of the project after taken over by the Navy. 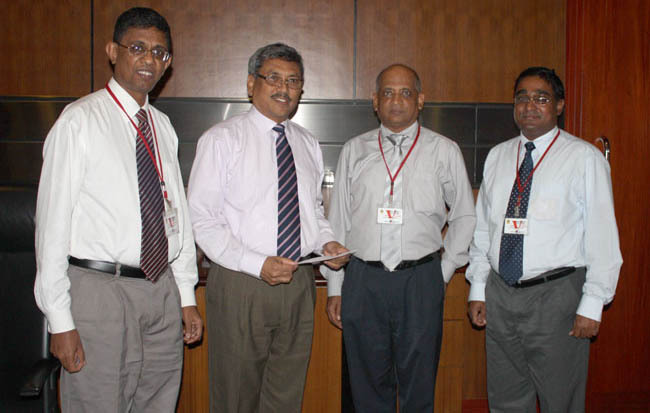 Central finance Company PLC handed over a cheque worth of Rs. 3,407,500 to Secretary Defence Mr. Gotabaya Rajapaksa on 13 November. This contribution is for the lease of three wheelers under the "CF Viru Diri Leasing" scheme. According to the records, CF has leased 1,363 three wheelers in October 2009 under the "CF Viru Diri Leasing" scheme. CF contributes Rs. 2500 from each three wheeler they lease as agreed upon, to the "Api Wenuwen Api" fund Mr. Jaliya Illangakoon (Regional Manager), Mr. Prasanna De Silva (General Manager - Credit) and Mr. Chandika Hettiarrachchi, (Assistant General Manager - Credit) representing the Central Finance Company PLC, also participated at the occasion. Employees of Wijeya News Papers Ltd has made their contribution, a sum of One million rupees to the " Api Wenuwen Api" Fund. 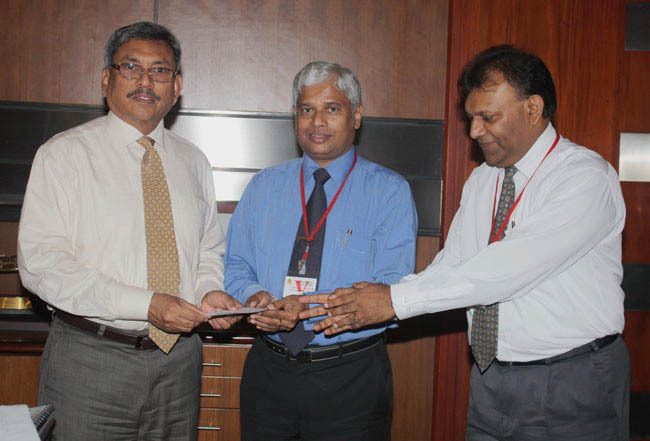 Mr. Lal Jayawardena, the Executive Officer Wijeya News Papers Ltd handed over the donation worth of one million rupees cheque to Secretary Defence Mr Gotabaya Rajapaksa at the office of the Defence Secretary on 13 November. The Api Wenuwen Api fund has been raised by the Ministry of Defence for the benefit of war heroes who liberated the country from 30 years of brutal terrorism. Mr Prithe Viraj Silva Director Finance and Mr. Ariyananda Dombagahawatta Editor Sunday Lankadeepa also participated at the occasion. The houses build by the "Api Wenuwen Api" fund will be handed over to 1509 valiant soldiers on 22nd November by H.E. 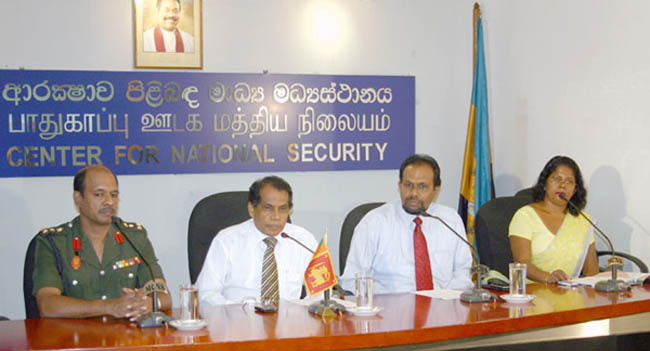 the President Mahinda Rajapaksa, said additional Secretary of Ministry of Defence Mr. Willy Gamage at a media briefing at Media Centre for National Security premises. He further stated that Public Relation and Development division of the Ministry of Defence is building 50000 houses for soldiers under the supervision of the Secretary of Defence Mr. Gotabaya Rajapaksa. The first phase in this venture is to donate free of charge a plot of land for the soldiers who have no houses. The second is to give a loan or donate funds to soldiers currently in service in order to build their house. He clarified that this loan would be given interest free to all service men with a special emphasis on disable soldiers. Also the third step is to join with government institutions to continue this housing project. Accordingly every GS Division together with the Ministry of Nation Building will be constructing two houses each for soldiers. As the fourth phase in this venture Ranaviru Villages will be established in rural areas according to a concept of the secretary of Defence. The first Ranaviru Village is established in Ipologama area in the Anuradhapura district. Mr. Gamage went on to say that an area of 180 acres had been used to build the village and 1509 houses have been fully constructed. He went on to state that the specialty in this Housing Project is that it veers away from the traditional low cost project types to create a place of high quality facilities in order to uplift the pride of the brave soldiers who saved their motherland. Furthermore this town would have high quality schools, good roads, banks, playgrounds and super markets Mr. Gamage clarified. He stated that the main aim in this project was to enhance the living conditions of the brave war heroes who have done so much for their country. He further affirmed that the Government would be spending a sum of 2.5 million rupees each for the houses being constructed for the soldiers while stating that when giving these houses they would exclude the cost of land and give them for a reasonable price of 800,000 rupees. Furthermore facilities have been made for this sum to be paid interest free over a period of 20 years. He clarified that steps have been taken to donate several houses in the 'Rana Jaya Pura' Housing Project to chosen servicemen on the 22nd of November. The persons to receive these houses have been meticulously chosen by the respective welfare directors he stated. Speaking at the media briefing Director General of the Media Centre for National Security Mr. Lakshman Hulugalle stated that this was the first time in the history of Sri Lanka that a housing project comprising of 50000 houses was initiated for the benefit of the soldiers. He went on to say that Ranaviru villages would be constructed and donated for the use of the soldiers as a part of this project. He affirmed that the Secretary of Defence was personally dedicated to ensure the success of this project and he had visited every district in order to look into the welfare of the war heroes and their families. As a prelude to that the housing project had been established. Furthermore the Defence Services College has been in progress for over 02 years and steps would be taken to increase its facilities in the future. Apart from that the Kotalawela Defence Academy had been conferred the status of a university while also increasing the salaries of the Defence personnel in order to uplift their living conditions. He clarified that the Government had taken adequate steps to ensure the living standards of the soldiers. Military Spokesman Brigadier Udaya Nanayakkara, Assistant Secretary of the Ministry of the Defence Ms. Malkanthi Rajapaksa along with many members of the media was present at the media briefing. The 'Poppy day and the Security Forces Heroes' day will be commemorated today (08 November) morning at the War Memorial at Vihara Maha Devi Park. War heroes paid the supreme sacrifice for a better tomorrow for all of us. Hence, it is our paramount duty to pay tribute to their martyrdom. 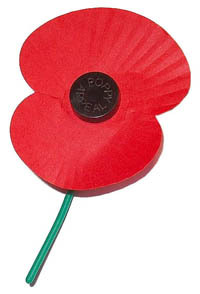 Poppy Day is commemorated internationally on second Sunday of November. It was started in 1921 and the proceeds from the sale of Poppy flowers' are used to fund the welfare of the families of war heroes. According to the folk lore, blood red Poppy flowers had bloomed where heroes of the First World War (1914-18) were buried. A few months after the end of the war, an American woman, Moina Michel wore a Poppy flower to symbolize the heroism of the heroes who died in action. After that, the YMCA took the initiative and sold Poppy flowers and proceeds used to uplift to life of the people in war-ravaged areas in France. Poppy flowers were brought to the first ever Commemoration ceremony held in England from France. Next year in 1922 a Poppy flower manufacturing centre was set up in London, giving a fillip to the international Poppy flower movement. It was in the month of November that the Second World War recorded its victory over fascism and Nazism. So it is the appropriate choice to pay our tribute to heroes. Tomorrow (08) war heroes who paid their supreme sacrifice in World Wars and in the patriotic anti-terrorist war will be remembered. The funds collected by the sale of Poppy flowers are used for the welfare of the families of the heroes including the disabled. The ex-servicemen too are looked after. Elderly ex-servicemen who live in the Elders' Home in Katana make small wreaths from Poppy flowers in memory of their brethren who had paid the supreme sacrifice. The war heroes' day or the Poppy Day is commemorated in all war heroes' memorials throughout the island, in a simple but dignified manner. Let us wear a Poppy flower proudly to express our gratitude to the heroes who sacrificed their youth for the sake of our motherland. We must not forget that it is our responsibility to ensure a bright future for the families of the war heroes, for they ensured a bright future for the present and future generations. 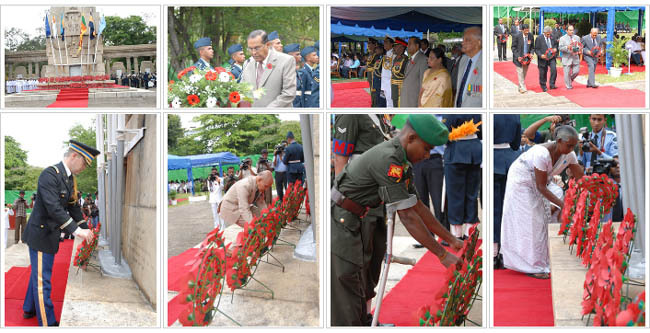 Nation salutes war heroes on "Remembrance Day"
The "Remembrance Day", annually organized by the Ex-Servicemen Association in memory of fallen War Heroes was held at Viharamahadevi Park Colombo, today (08 November) with attendance of a host of distinguished guests and service personnel. The Chief Guest of the event Former Army Commander General (Retd) Hamilton Wanasinghe and other invited guests were welcomed at the entrance by the senior office bearers of the Ex-Servicemen Association pinning a poppy flower on them. After a two-minute silence was observed, the Last Post by Tri-services buglers was sounded bringing everybody present to attention in memory of the Remembered. Religious observances of four major faiths were conducted by respective priests and then the National Anthem was recited. Next was the time to pay floral tribute in memory of all valiant servicemen who sacrificed their lives in the two World Wars and those who died combating terrorism and insurgencies in the country. The Chief Guest and other invitees including Chief of Staffs representing Commanders of Tri-services, foreign diplomats and military officers, living soldiers who fought at the World War II and soldiers who became differently-able during war in the north and east placed floral wreaths at the foot of the cenotaph. Culmination of the Remembrance Day programme saw a smart parade that saluted the cenotaph. Sri Lanka Air Force Band, Tri-service soldiers, Ex servicemen and Sri Lankan soldiers who served with the Royal Army, marched forward with their shining decorates and dignity. Peace loving citizens and patriots have joined to further strengthen the "Api Venuven Api Fund" , the noble concept launched to build houses for soldiers. Nearly 3.5 million rupees collected by Tea Smallholders on behalf of the Fund was handed over to President Rajapaksa. The presentation took place at Temple Trees yesterday. Managing Directors of the KDU Group of Companies Saman Upasena and Thushan Upasena, representing the Tea Smallholders handed in the donation. In addition, the KDU Group of Companies donated 2.5 million rupees for the "Ranaviru" Fund. Donation to "Api Wenuwen Api"
A group of Sri Lankan students from Griffith University, Nathan Campus Queensland Australia has organized a musical event to raise funds for the war heroes. They have collected a sum of Rs. 537,470 for the "Api Wenuwen Api" fund. Mr. Nalin Attygalle and Mr. Abe Amaradasa representing the students handed over the donation to Secretary Defence Mr. Gotabaya Rajapaksa at the Ministry today. The students have sent a message along with the donation stating that, "All the students under 24 years want to show the entire world that we, Sri Lankans are united and we care for our brothers and sisters in armed forces. We really appreciate the political leadership of His Excellency the president Mahinda Rajapaksa, Secretary Defence Mr. Gotabaya Rajapaksa and entire Sri Lankan forces for their outmost commitment towards liberating the country from terrorism. Now we Sri Lankan stand taller than anyone else in the world as the only nation who has been able to eradicate terrorism." 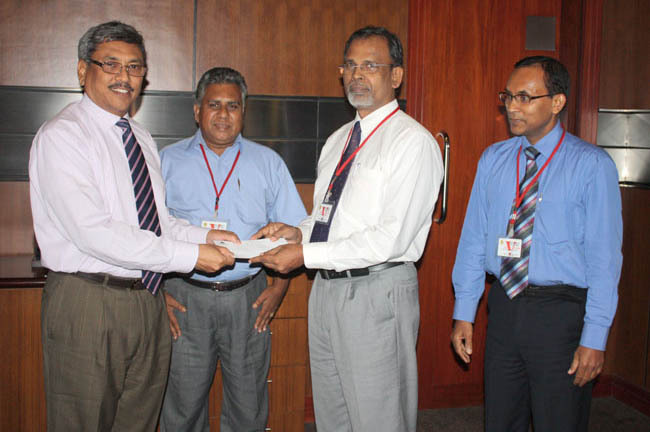 Central finance Company PLC handed over a cheque worth of Rs. 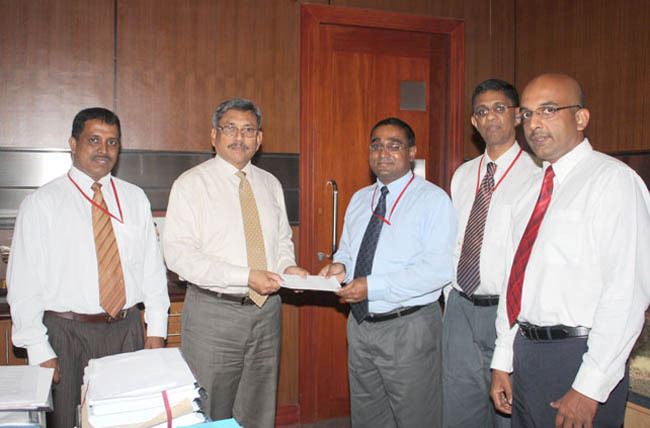 2,562,500 to Secretary Defence Mr. Gotabaya Rajapaksa today. This contribution is for the lease of 1025 three wheelers under the "CF Viru Diri Leasing" scheme. Mr. Prasanna De Silva (General Manager - Credit),Mr. Anil Goonathilaka (Senior Assistant General Manager - Marketing) Mr. Chandika Hettiarrachchi, (Assistant General Manager - Credit) Mr. Mangala Artigala (Product Manager) representing the Central Finance Company PLC, participated at the occasion. CF contributes Rs. 2500 to the "Api Wenuwen Api" fund for every three wheeler they lease under "Viru Diri Leasing" scheme. 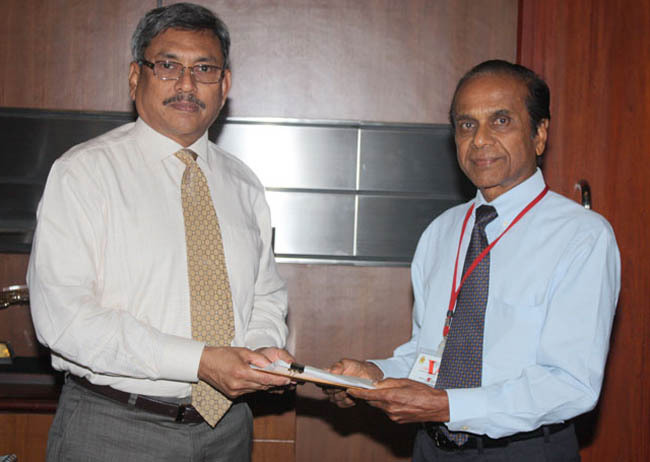 A sum of $ 1885 received as a donation for "Api Wenuwen Api" fund from Sri Lankan expatriates living in California USA, was handed over to Secretary Defence Mr. Gotabaya Rajapaksa at the Ministry today by Mr. Bernard Peiris. Prior to this, Sri Lankan expatriates in California have contributed a sum of $ 35860.17 for the "Api Wenuwen Api" fund.